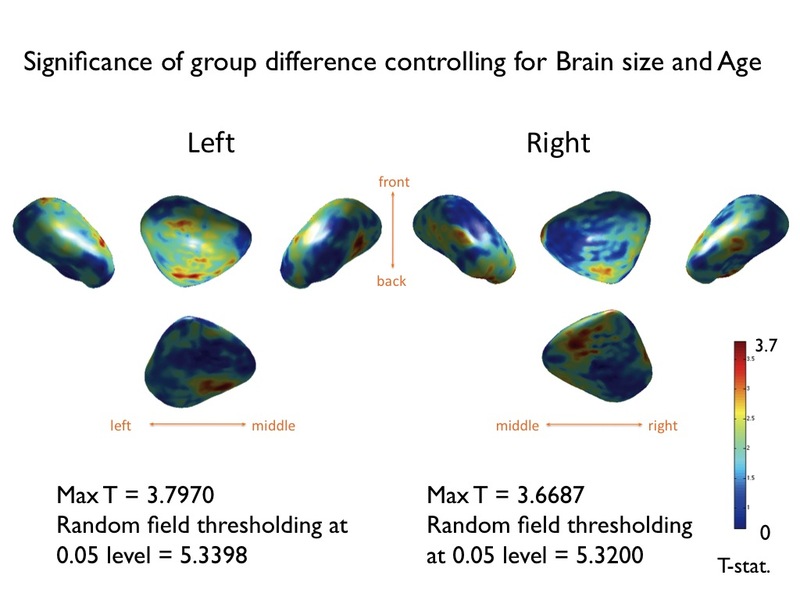 Using the weighed spherical harmonic (SPHARM) representation   , amydala surfaces will be parameterized and discriminated in a two group comparision setting. The implementation is based on MATLAB 7.5 and a Mac-Intel computer (MacBook Pro). If you are using any of the codes or imaging data set given here, please reference  or . The complete and processed amygdala surface mesh data set used in Chung et al. (2010)  is stored as chung.2010.NI.mat. It contains the surface displacement vector fields on the template surface, group identifier and age and the template surface. The subset of data published in , where the gaze fixation duration is avaialble is stored as a seperate file amygdala.volume.mat. It consists of the manual amygdala segmention of MRI of 10 control and 12 autistic subjects that also have gaze fixation duration. The first 10 subjects are controls and the remaining 12 subjects are autistic. They will be coded as binary numbers (control =0, autism=1). surf is a triangle mesh consisting of 1270 vertices and 2536 faces. If you constructed the analyze file format incorrectly, MATLAB will produce an error message and my not load properly. Make sure the image orientation is properly aligned, using other tools such as AFNI or SPM. surf can be visualized using the following commend. Figure 1. The coordinates directly correspond to the voxel positions of Tracing_mask_left.img. Right figure is generated using MRIcro. 2. Data Set Published in Chung et al. (2010), NeuroImage. We also made the subset of the data set, in which the additional gaze fixation duration is given, available here. It consists of the manual amygdala segmention of MRI of 10 control and 12 autistic subjects that also have gaze fixation duration. We also changed the data format to logical and saved as a single mat file to reduce the file size. The mat file contains 7 varaibles (age, brain, eye, face, group, leftvol, right vol). leftvol and rightvol are binary segmentation stored in the logical format (o or 1). The following code will display the amygdale of the first subject. The right amygdala is colored in green while the left amygdala is colored in yellow. The traditional amygdala volumetry can also be done. Make sure that vol only contains values 1 and 0 otherwise, the following code will not work. Figure 1-1. The left and right amygdale volume for all subjects published in Chung et al. (2010) . There is no group difference and no hemisphere difference. The surface flattening from an amygdala surface to a unit sphere is needed for establishing a spherical harmonic parameterization on the amygdala surface  . We have developed a novel flattening techniue using heat diffusion. We first enclose the amygdala binary mask with a larger sphere (Figure 2 left). Take the amygadala as a source (value +1) and the sphere as a sink (value -1). With the heat sink and source, we perform isotropic heat diffusion for long time. After suffiient amount of time, we reach a stady state, which is equivalent to solving the Laplace quation. The following code will run approximately 1 min. per surface in a qaud-core computer. The result is given in Figure 2. The last arguemnt indicates the number of iterations used to obtain the steady state heat equation. 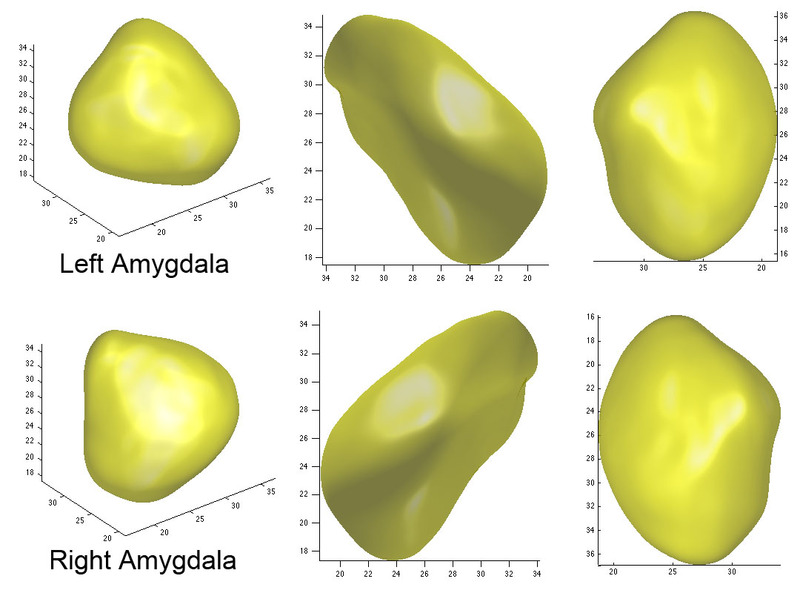 In publication , 30 iterations were used but for simple shape like amygdala, 5 iterations are probably sufficient. Figure 2. Left: The amygdala is asigned the value 1 and the sphere enclosing the amydala is asigned the value -1. Right: After solving isotropic heat diffusion for long time, we reach a statedy state, which can be used to generate a mapping from the amygdala surface to the sphere by taking the geodesic path from value 1 to -1. 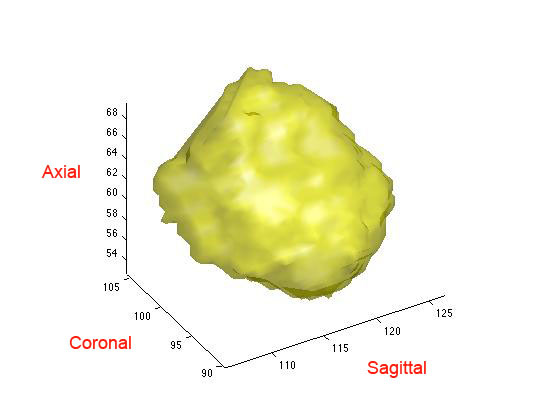 The stady state map (Figure 2) is used to generate a mapping from the amygdala surface to the sphere. This is done by computing the geodesic path from the source to the sink. We first compute the levet sets of the stady state corresponding to f(p) = c for -1 <= c <=1 and propagate the amygdala boundary (c=1.0 in Figure 3) to the next level set (c=0.6) by computing the geodesic path. The propagation from one level set to the next is done by LAPLACEcontour. The flattening process is expected to produce discretization error. For each level set, we regularize mesh by shrinking down larger than expected area of triangles using REGULARIZEarea. 20% of the larger than expected triangles are reduced in size by setting the parameter to 0.8 in REGULARIZEarea. Figure 3. Amygdala surface flattening process using the geodesic path of of the stady state map. The parameters correspond to the level set f(p)=1.0, 0.6, ..., -0.6, -1.0.
figure_trimesh projects Euler angles \theta and \varphi to the amygdala surface (Figure 4). The spherical angles are necessary to establish the weighted spherical harmonic representation on a unit sphere. The additional MATLAB implementation details on the weighted spherical harmonic representation can be found in this link [click here]. Figure 4. The spherical angles projected onto an amygdala surface. North pole is taken where \theta=0 (blue peak in the left figure). where surf is the amygdala surface and sphere is the spherical mesh obtained by running LAPLACEcontour and REGULARIZEarea. When the bandwidth is zero, i.e. sigma=0, the weighted spherical harmonic representation becomes the traditional spherical harmonic representation. See refernce  and  for detail. Figure 5 shows various degree representation. Figure 5. Spherical harmonic representations of an amygdala surface. The Fourier series are known to introduce the Gibbs phenomeon (ringing artifacts) . The Gibbs phoenomeon occurs near rapidgly changing or discontinous measurments. Since the spherical harmonics are continuous and smooth basis functions, it is not possible to represent discontinuity of data using spherical harmonics. Figure 6. The Gibbs phenomeon is particuarly visible in the SPHARM representation with k=42 and sigma=0. The ringing artifact is reduced if we introduce a bit of smoothing sigma=0.001. The following line of codes will process a surface corresponding to subject id(i,:) and save the results into a seperate *.mat file. The average amygdala surfaces are constructed by averaging the collection of Fourier coefficients up to degree 15. unitsphere2562.mat is a spherical mesh with 2562 vertices. 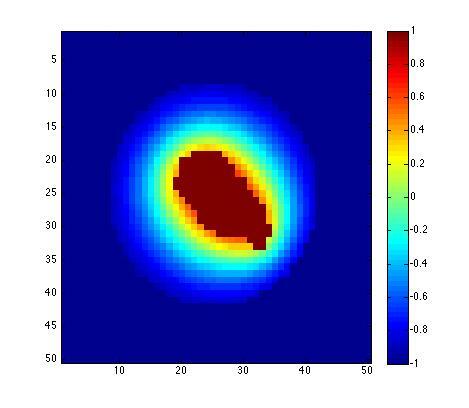 This is the mesh resolution we will resample the average amygdala surface. 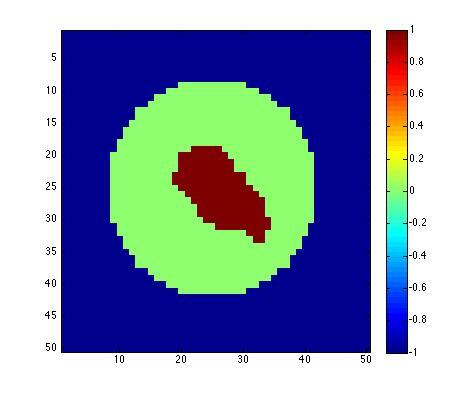 The parameter sigma=0.01 introduce a bit of smoothness into the representation . Figure 7. 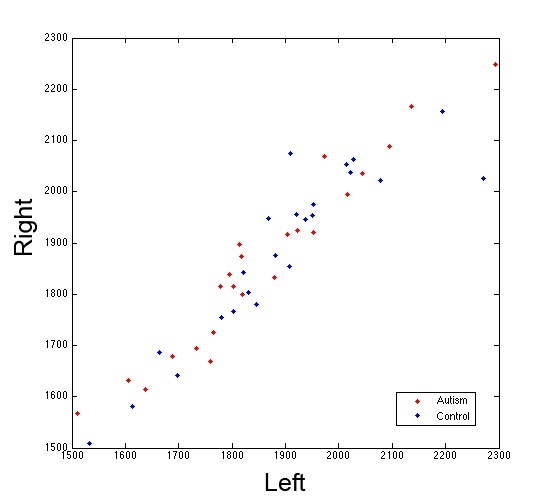 The average left and right amygdala surfaces over 47 subjects (24 control and 23 autistic subjects). From study_left and study_right that contain Fourier coefficients, we construct the weighted spherical harmonics with degree 15 and bandwidth sigma 0.01. The resulting coordinates are stored as matrices left_surf and right_surf. left_c contails all surface coordinates for control subjects while left_a contains all surface coordinates for autistic subjects. Then the Hotelling's T-square statistic is used to measure the discrepancy between autistic and control amygdala surfaces. h is the Hotelling's T-square statistic and p is the corresponding p-value (uncorrected). Figure 8. The p-value of testing the significance of group difference projected on to the mean control surface. The white arrows indicate where to move the the mean control surface to match it to the mean autistic surface. 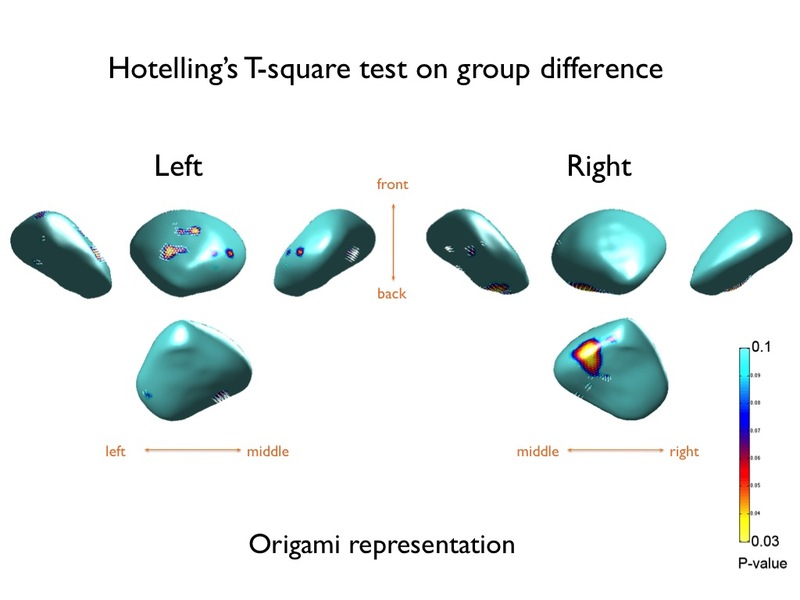 The Hotelling's T-square did not detect significant difference (at the corrected p-value of 0.05) although there is a huge cluster on the right amygdala. The problem with the Hotelling's T-square approach is the lack of control for other covariates such as the global brain size and age. So we need to covriate these nuisance variables into a statistical model. This can be done if we use the multivarite general linear models (MGLM) framework, which is implmented in Keith Worsley's SurfStat package . In order to peform the analysis given here, you need to download the package, install it and set up the proper path. Suppose we performed the weighted-SPHARM and obtained the spherical harmonic coefficients up to degree 40 for all 22 subjects. The results is saved in *.mat file. The following codes display the coefficients of the x-cooridinates of the left amygdala of the 1st subject. SurfStat needs to rearrange the array of coordinates as 22 (number of surfaces)*2562 (number of vertices) * 3 (dimension). We need to convert our average mesh to the SurfStat format. 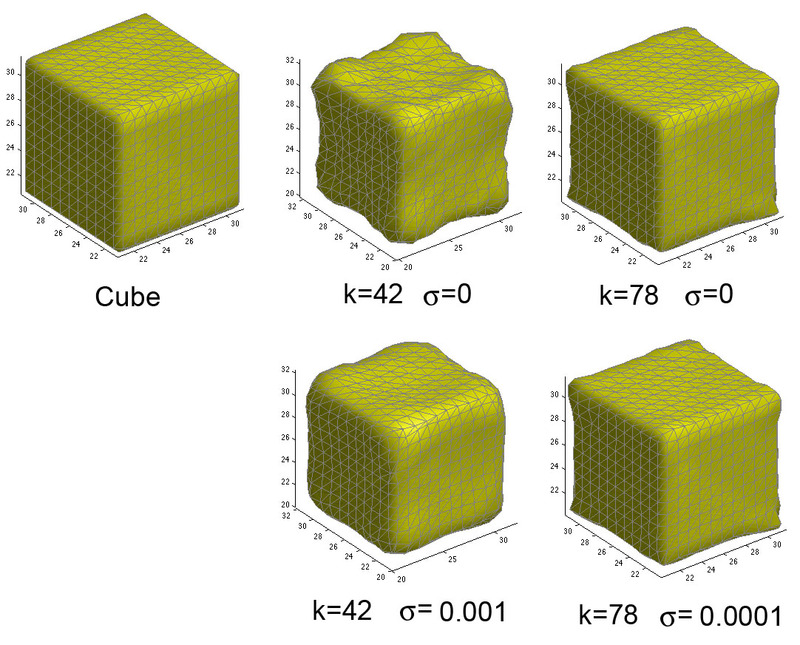 Then we obtain the displacement between each surface to the average surface. The displacement vector field is used as a response variable in the GLM. Using SurfStat codes, we define terms. The T-stat threshold of 4.7354 corresponds to the corrected P-value of 0.05. Figure 9. The maximum T-stat (left) is 3.7970 but it will not pass the random field theory based multiple comparision thresholding at 0.05 level (5.3398). Nacewicz et al. showed that the smaller amygdala volume predicts the smaller gaze fixation duration (eye over face) in autism: individual with smaller amygdale showed the least fixation of eyes relative to other facial regions. We wanted to test if the local anatomical difference in amygdala is correlated with the gaze fixation duration (Figure 10). Figure 10. Significant interaction difference betewen the group variable and the gaze fixation duration for the left (a) and right (b) amygdale. See Chung et al. 2010  for detail. Chung, M.K. Nacewicz, B.M., Wang, S., Dalton, K.M., Pollak, S., Davidson, R.J. 2008. Amydala surface modeling with weighted spherical harmonics. 4th International Workshop on Medical Imaging and Augmented Reality (MIAR). Lecture Notes in Computer Science (LNCS) 5128:177-184. Chung, M.K., Dalton, K.M., Davidson, R.J. 2008. 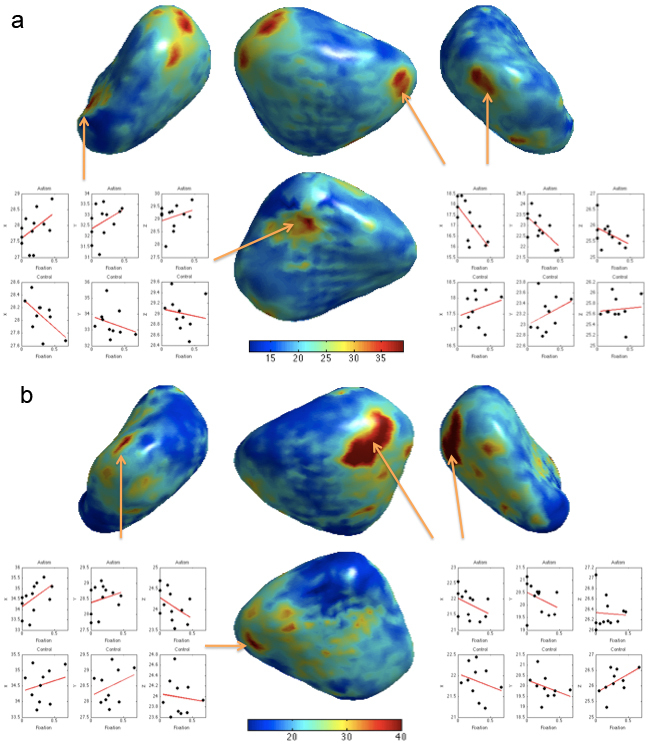 Tensor-based cortical surface morphometry via weighed spherical harmonic representation. IEEE Transactions on Medical Imaging. 27:1143-1151. Chung, M.K., Dalton, K.M., Shen, L., L., Evans, A.C., Davidson, R.J. 2007. Weighted Fourier series representation and its application to quantifying the amount of gray matter. Special Issue of IEEE Transactions on Medical Imaging, on Computational Neuroanatomy. 26:566-581. Chung, M.K.,Qiu, A., Nacewicz, B.M., Dalton, K.M., Pollak, S., Davidson, R.J. 2008. Tiling manifolds with orthonormal basis. 2nd MICCAI Workshop on Mathematical Foundations of Computational Anatomy (MFCA). Chung, M.K., Worsley, K.J., Nacewicz, B.M., Dalton, K.M., Davidson, R.J. 2010. General multivariate linear modeling of surface shapes using SurfStat. NeuroImage. 53:491-505.